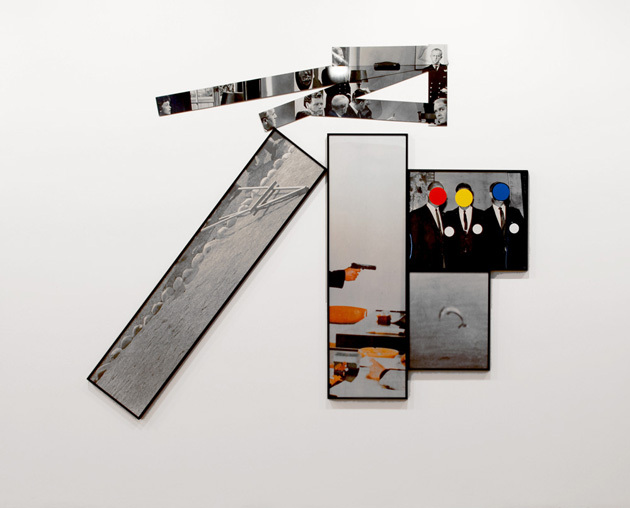 "John Baldessari's 1987 work titled The Fallen Easel is made up of nine framed panels containing fragmentary images that seem to add up as a complex non sequitur. The lone diagonal panel shows a grayscale screen print of an easel laying on the ground, while other panels show faces and hands that are sometimes obscured by ovals of bright flat colors. Clearly, we see a rebus of sorts, but its substitution of picture–fragments for a syllogistic circuit remains just outside of the grasp of routine readability. Mentally reassembling them does not help, and the narrative context that would enable the work to be analyzed in the manner of a dream is missing. We can only conclude that the relationship between the work's diverse elements is one of an evocative and visually stylish provisionality, but we remain haunted by it, for it keeps us coming back in search of the key that will unlock its beguiling mystery of allegorical displacements and substitutions. Yes, this is an update of a kind of surrealism, but there is something else going on here as well, something pertaining to the typical psychological distance created by mass media imagery striped of its pretense of narrative coherence. All at once, the linked histories of Surrealism, Pop Art, Conceptual Art and Postmodernism flash before our eyes. We are not in Kansas anymore, but is unclear exactly where we are or where anything else is for that matter." Fig.1 John Baldessari (1987). "The Fallen Easel" colour lithograph and screenprint in five parts printed on paper and aluminium plates. Collection of Jordan D. Schnitzer. Photo: courtesy of Legion of Honor Museum.